Get ready for the closest thing to real ham you've ever tried! The Country Fresh Vegan Ham from Loving Hut is made to give you a flavor and texture that's so close to real ham, many non-vegans would be challenged to figure out that it's meat-free. Whether you slice it for sandwiches, serve it as the centerpiece for a holiday meal, cube it for appetizers, or add it to your favorite soups and stews, you're sure to be pleased with the end result! Large 2.18 lb. / 35 oz. 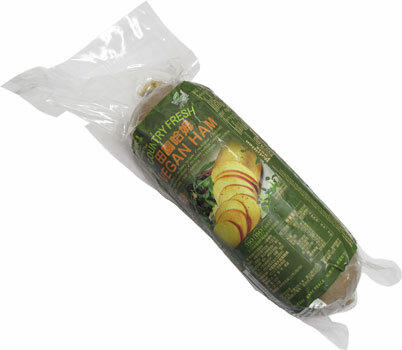 (1000g) Country Fresh Vegan Ham is $16.99. From Anonymous of San Antonio, Texas on 4/3/2018 . Has no discernible flavor, no matter how many ways I tried to spice it up. From Roger Gray of North Little Rock, Arkansas on 11/11/2017 . Frying this up, I thought the texture was spot on, but it tasted kinda weird. But then I marinated it for a couple of days in a mixture of spices and Louisiana Hot Sauce, and then fried it with vegan butter and molasses. The result was excellent! Tasted almost exactly like cajun ham. From Shannon of Memphis, Tennessee on 6/14/2017 . I was so excited to try this because I miss the flavor of ham. This tasted more like a turkey loaf...not horrible but not what I was hoping for. I'm going to try chopping it up in the food processor to make a "ham" salad sandwich as well as preparing it with a ham glaze and maybe pineapple to give it some more flavor. Easy, uncomplicated prep.A little ingenuity.This loaf is a keeper! From Leeza of New York, New York on 11/17/2016 . We cooked half-inch slices until they were browned two ways: grilled, which made them crisper on the edges, and in an old heavy seasoned pan -- no oil or added seasonings for us, but you can brush them with your favorite oil and/or herbs and condiments -- we let them get very browned because this is what we prefer, but you can stop the process at any time. The result was delicious. We liked them equally. We enjoyed them with organic unsweetened apple sauce and steamed organic carrots and organic spinach. Another time, we pan-seared -- again without oil but you can brush with oil -- very thin slices which we let get very charred and crisp -- we folded the slices which crumbled nicely into baked potato with a yummy result. We added a little freshly ground mixed organic peppercorns just because we love them. You can also fold in a little mustard. What else would work: strips stir fried in vegan oyster (cruelty-free with mushrooms) sauce with green and red peppers and your favorite kind of onion for stir fry (or try a different kind of onion for a change), Also bake slices with a balsamic glaze -- we are planning to try this -- google "vegan balsamic glaze" for a nifty variety. Very simply cookery here -- easy and uncomplicated preparation. A little ingenuity. Wonderful eating. This loaf is a keeper. From Sandy of Chicago, Illinois on 4/20/2015 . Hub fried up slices using good seasonings and nothing helped. It's pretty tasteless and boring and my carni hub initially was intrigued because it reminded him of spam (in a good way, if there is a good way). Regardless, very plain, tasteless, boring, overall blah.